Get your Best Fit Big Data System Now! Aadhar is a 12-digit unique identity number (UIN) issued for Indian citizens, and it is the largest implementation of Big Data project in the world. 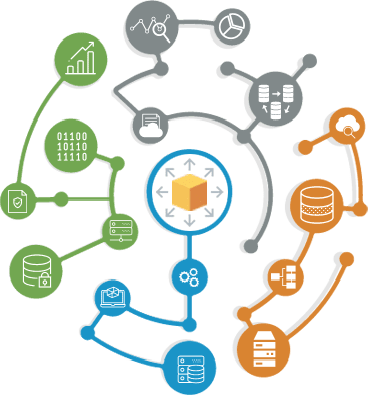 The client had their Hadoop Big Data implemented on early version of Cloudera distribution. They wanted to try and migrate to any latest Hadoop distribution. GrayMatter, as a leader amongst hadoop consulting companies, provided best-in-class hadoop consulting & implementation expertise, which enabled the best fit solution. A multinational beverage and brewing company with global headquarters in Leuven, Belgium. It was the world's largest brewer and is considered one of the largest fast-moving consumer goods (FMCG) companies in the world. Advisory organization that develops insurance policy forms and loss experience rating information. The crucial need was a scalable analytics platform for the growing data volumes. Data integrity issues, which keep changing as per business rules. Also, their Reporting on transactional data was causing limitation in drawing necessary insights. Complex data coming from repair stations, manual inspections, and corporate master data, manufacturing machine logs, manufacturing test station, ERP, CRM and few other sources. The data volume could be in tune of 10+ TB with 30-50GB data coming in every day. GrayMatter drives palpable benefits of business to every client and duly shifts the analytics from being centers of cost to that of revenue. Our Big Data consulting practices integrate data analytics with Big Data to manage the information lifecycle which has not received its much deserved attention. Our features are integrated with in-depth expertise in big data to assist clients in making optimized decisions and results. Being one of the major Big Data analytics companies, we make sure our structured engagement approach ensures fair investment in moulding a robust capability on big data through the development of industry-specific solutions that will deliver industry assessment to our respected clients. The experts and dedicated consultants of big data at GrayMatter assist the clients in the realization of genuine values of corporate business in the platform of big data. We provide an all-inclusive roadmap on the technologies of big data and a framework and architecture of reference along with best possible practices for the implementation of technologies. Our data visualisation techniques for reporting and analysis of use cases of big data, for implementation of BI, advanced visualization technology of big data, predictive prototyping and complex analytics has acquired us a niche in the industry. At GrayMatter, we identify the inherent opportunities of Big Data with the aim of improving the future of innovative analytics for the same. Count on us as the best choice amongst the other in the lot of Big Data consulting companies. High volumes of complex data are acquired from a variety of data sources and processed. What is the structure of data sources which needs to be leveraged within business? Is it unstructured, semi-structured or highly structured? What is the analysis type which should be used? Is this batch or streaming/real-time? What is the volume of data received? Are these massive chunks or small and fast chunks? How to store data or how to process it? Data frequency of the data being processed? Is it on-demand, continuous feed or real-time? What type of data sources do we need to work with? Web & Social, Machine generated, human generated, biometric, transactional system or other? What will be the consumers of this data? Will it be human, business process, other enterprise applications or other repositories? GrayMatter has an experienced team of Big Data Specialists. GrayMatter’s Big Data experts have skills in a variety of technologies & tools including Hive, Cassandra, Hadoop, Spark, Hbase, MongoDB, Kafka and Flume. GrayMatter’s offerings in this space range from Big Data Consulting Services to the implementation of the advisory provided. GrayMatter’s stellar experience and skills ensure that path-breaking Big Data Analytics consulting and implementation are delivered to every customer, which makes GrayMatter stand out amongst big data analytics companies. At GrayMatter, Your Business Matters! GrayMatter Software Services Pvt. Ltd.
Fredrikinkatu 51-53 A, 00100 Helsinki, Finland.